Definitely a case of the Mondays going on over here. I am coming off a wedding weekend, which you photographers know is both wonderful and exhausting. My hubs has started a new job that's six days a week again and we are slow to readjust. We feel a little bit more like tag team wrestlers than husband and wife, but we know it's just another full season! What did you friends do this weekend? 1. We dealt with sick kids. It was mostly a sneaky fever that kept coming and going with a sore throat. Thankfully today no one has fever and all three kids at least ate some kind of breakfast. It's a sign we are moving in the right direction! 2. I just planted my kids in front of Curious George to get 5 minutes productivity. 3. I am putting off the twins first dentist appointment. I keep delaying. I am not sure if it's because it's just hard to schedule another thing or if I don't want to deal with all the explanations. I vow to try to get it scheduled by the end of the week! 4. I did get those Teaberry skinny jeans from AE and wore them yesterday. I have to say, glad I went a size bigger because I needed the space in the "skinny" cut :) Glad I took the chance though, I think they're cute. 5. Preschool open house is this week, it's getting closer! I am holding out hope that preschool will help some of my feelings of insanity with three kids 3 and under in the house every day. Maybe I have delusions of grandeur but I am really praying it helps us a bit! It's been hard to keep people engaged, happy and not wanting to wreck each other's day. 6. The wedding this past Saturday was gorgeous...everything, including the gorgeous 70 degrees and sunshine weather, made the day perfect! 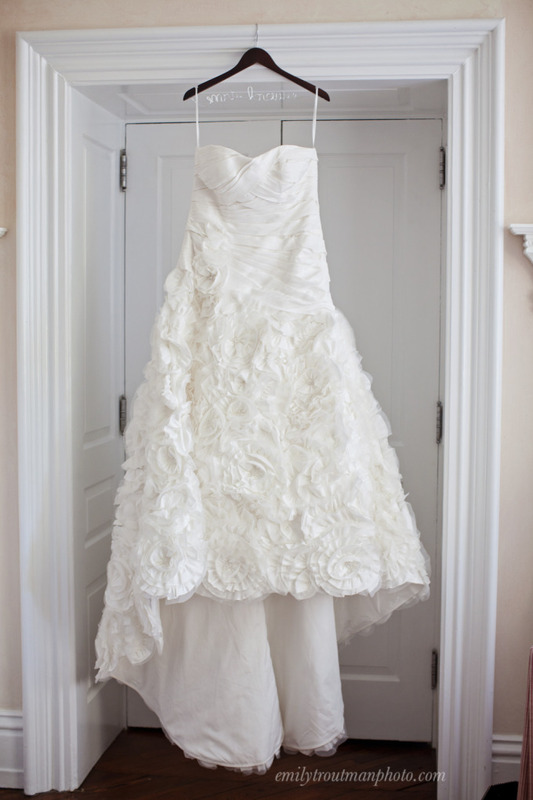 Here's a sneak peek of the beautiful bridal gown! 7. There is a list of other "to-do's" I have been putting off that I need to tackle. It's tough when you feel like you are just in "survival mode" because of busyness, you use every waking moment to stay afloat - much less get ahead. I have felt like this so I am saying no to anything else photography related this fall. I want to keep the clients happy that have already hired me and I want to keep some sanity. I was just reading an article about how it's really a lie that Mom's can truly do it all. In other cultures and former eras, mothers had the help of live in family members, etc. We really place such high expectations on ourselves, it's no wonder we have "mom guilt." We are left thinking we just aren't good enough if we can't do it all. I say, choose what matters every day. If your day ends with dishes in the sink and you just can't muster the energy to do them, it's OK. Tomorrow is a fresh start! I think this is equally a struggle for all moms, whether working in or out of the home or both! 8. I have been reading a truly deep and encouraging book by Nancy Guthrie called Holding onto Hope. Her story is amazing but what is truly amazing is how she points us towards God. One line that is sticking in my brain is "Bitterness is ultimately blaming God for the circumstances of our lives." Make you uncomfortable? Me too, but that's because it's true. "We might not say we blame God outright, but we become bitter." What things are you holding onto today that really need to let go of? Are you blaming God? I am SO convicted over this right now!